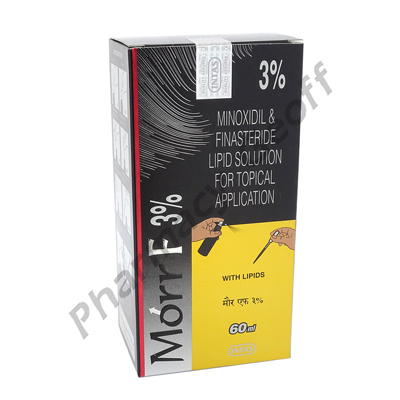 Morr-F containing the 2 active ingredients minoxidil and finasteride is an anti-hypertensive, vasodilator treatment used to halt hair loss and promote hair regrowth. It works by encouraging hair follicles that have stopped producing hair to begin making new hair and inhibit the natural hormone DHT from forming. It is mainly used by adult men to treat male pattern baldness at the crown or the middle of the scalp. Morr-F should be massaged into the scalp with your fingers once per day or as directed by a doctor. Contact a doctor for the correct dosage and length of treatment as it will depend on the patient's condition and their response to the therapy. Do not stop the medication without consulting a doctor as discontinuing the treatment may cause the newly regrown hair to fall off. Contact a doctor immediately should side effects persists or worsen. The medication should not be used by women or men below the age of 18. Morr-F is not always suitable for all patients. Always consult your health care provider prior to using this medication if you are pregnant, breastfeeding, trying to conceive, using any other medication (prescription or non-prescription), using any herbal products or supplements, or if you have any allergies or other health problems.